St Michael’s Preparatory School was established in Jersey in 1949 and has operated from its current site in St Saviour since 1952. 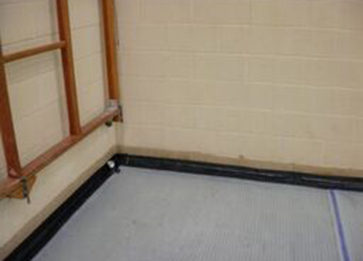 External waterproofing to the sports hall, constructed in 1994, had failed at wall/floor and floor/floor joints, leading to severe water ingress. St Helier based Premier Contracting used waterproofing products from Triton to replace the previous failed system before the sports floor was reinstated. A system comprising Platon P8 cavity drain membrane and Triton Aqua Channel drainage conduit was specified which would divert any water still entering the hall at these vulnerable joints to external gravity drains at the front of the building. The 500m2 sports hall is earth retaining to one end and partially around two flanks. To address the risks caused by a variable water table which sometimes rises to floor slab level, an additional detail was designed incorporating a 300mm high application of Triton TT Vapour Membrane to the lower walls with the P8 Membrane sealed to this over the Aqua Channel with Triton Cornerstrip. A TT Vapour Membrane detail was also designed to ensure the waterproofing system was not compromised where the gym apparatus floor fixings were bolted into the concrete floor. Triton Aqua Channel is designed to be used in conjunction with Platon Cavity Drain Membranes and is normally fitted to the perimeter of the floor. Any water enters the Aqua Channel through pre-drilled drainage holes and is then diverted to a suitable drainage point. Rodding eyes were installed every 10 linear metres to allow periodic maintenance of the system. BBA certified Platon P8 is a high-density polyethylene (HDPE) cavity drain membrane. It can be used to waterproof walls or floors and, following installation, its studded profile allows water to continue to penetrate the structure but then diverts it via the air gaps between the studs to the drainage point. Cavity Drain Membranes do not allow pressure to build up against the internal construction and the air gap behind them allows the structure to breathe and dry out. The membranes are loose laid on floors and fixed to walls using special plugs and sealing materials, with little or no preparation required to the substrate. Following installation of the new system, the membrane was screeded over and a wooden sports floor reinstated. Premier Contracting & Shopfitting was established in 1986 and has a strong reputation across the island for construction, house building and refurbishment, shopfitting, waterproofing, joinery, roofing and guttering. The St Michael’s school project was undertaken by the company’s waterproofing section.